Silly Galah! is one of those bright, colourful books that just begs for a child to pick it up. When they do, I can almost guarantee they won't be disappointed. This Book Chook's smile widened with every page! 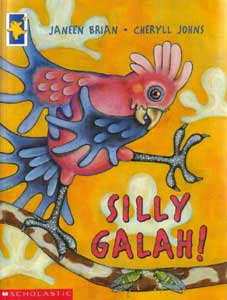 Written by Janeen Brian, and illustrated by Cheryll Johns, Silly Galah! was first published by Omnibus (Scholastic) in 2001, and has been re-printed several times since. I'm not surprised about the re-printing, because the book is just delightful. It's a collection of short poems about Australian animals, accompanied by interesting facts and Johns' charming illustrations. Brian's poetry is such fun! Pitched at child level, it focuses on an important feature about each animal, while inviting the reader to enjoy a laugh, and celebrate this writer's obvious love of language. on his little frog belly. which is curly and whirly and strong. for berries and fruit all night long. Each animal has a page or double page spread, with a semi-realistic background for the dominant, cartoon-like, animal picture. Johns' illustrations perfectly complement Brian's text - you can almost hear the screeching on the Cockatoo page! The poem is also central, and the factual sentences are written around the perimeter of the page. The ever-changing details of insect activity add another layer to the visual text, and provide even more interest for young readers. I've reviewed several books by this prolific and talented Australian author (Too Tight Benito, By Jingo!, Columbia Sneezes, Elephant Mountain - recently selected as a Notable in the Younger Readers Category of the 2009 Children's Book Council of Australia Awards - Oddball, and Where does Thursday go?). I've enjoyed them all, but I believe Brian's talent that impresses me most is her ability to get inside kids' heads and give them material that makes them grin, giggle, and want more. Silly Galah! is an excellent choice for people looking to introduce their children to poetry, and is also a great non-fiction resource about Australian animals. I predict it will become a much requested read-aloud in any home. It would also be a wonderful gift for a child living outside Australia. Parents looking for follow-up activities could find some cute colour-in outlines at ABC TV, read animal facts at Australian Animals, get craft ideas at DLTK, or try a webquest on Australian Animals. If you would like more information about galahs, suitable for kids to read, try Teaching Treasures which has some simply worded facts. Janeen Brian's own website has an attractive project activity for children,and you can find more activities by scrolling down on this page. Check out the Youtube video below if you'd like to see what a galah looks like. Check out some great Poetry Friday posts at A Wrung Sponge!